With round three of the 2019 FIM Motocross World Championship taking place at the sandy track at Valkenswaard, Rockstar Energy Husqvarna Factory Racing rider Thomas Kjer-Olsen has claimed an overall runner-up result to extend his lead in the provisional MX2 World Championship points standings. Earning two strong fourth place results, Arminas Jasikonis secured a season-best fifth in the MXGP class’ overall standings. Entering the GP of The Netherlands with the points leader’s red number plate on his FC 250 machine, Thomas Kjer-Olsen put in two solid performances in the Dutch sand. Getting a good start in the opening MX2 moto, Kjer-Olsen found himself in second position at the end of the first lap. Putting is consistent lap times, he went on to secure the runner-up result. Well-placed in second shortly after the drop of the gate in moto two, Thomas had to settle for an eventual third-place result following a last lap pass by Jago Geerts. Collecting 42 valuable points at the GP of The Netherlands, Kjer-Olsen has extended his MX2 World Championship lead to 23 points over second-placed Henry Jacobi. Continuing to build on his speed and stamina following injury, Rockstar Energy Husqvarna Factory Racing’s Jed Beaton wrapped up the GP of The Netherlands with 10/15 results for 12th overall in the MX2 category. Recovering from a collarbone fracture that he sustained during round two of the MX2 World Championship in Great Britain, Rockstar Energy Husqvarna Factory Racing’s Mikkel Haarup was unable to contest the GP of The Netherlands. In the MXGP category, Rockstar Energy Husqvarna Factory Racing’s Arminas Jasikonis improved on the sixth-place overall result he claimed at the first two rounds of the series, finishing fifth overall at the Dutch GP. Collecting two well-deserved fourth place moto results, the FC 450 powered rider collected the same number of points as the third and fourth-placed competitors but had to settle for fifth overall due to his fourth-place result in the final moto. Former MX2 World Champion Pauls Jonass continued to make progress following his return to competitive action. 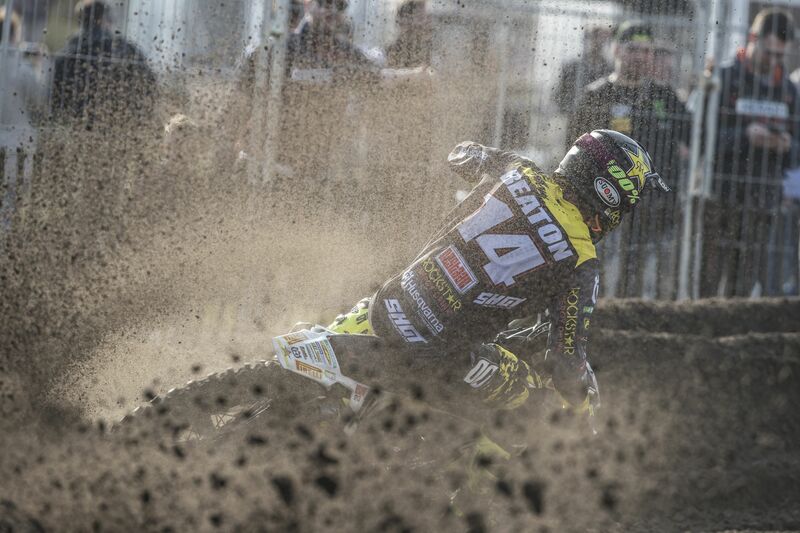 At Valkenswaard the young Latvian finished with 11th/14th place results for 11th overall at the GP. Making a strong debut at the FIM Europe EMX125 European Motocross Championship, TC 125 powered Kay de Wolf earned 5-2 results for fourth overall at the GP of The Netherlands. The Rockstar Energy Husqvarna Factory Racing team will return to action at the fourth round of the 2019 FIM Motocross World Championship in Italy on April 6/7. Download high-res images from the MXGP of The Netherlands here.